My love for abstract painting is strongly related to my fascination for skies , endless landscapes and astronomy. These elements I am incorporating into my abstract paintings. Therefore the mean topic of my work is : Painting gigantic , endless abstract worlds who form poetic reflectins of an universe. Already during my Academy time I instinctively started investigating these directions. By studying modern abstract painting combined with classical Japanse lanscape painting , I slowly developed a body of work which forms a kind of basis. I came to the conclusion that an abstract painting should be more than only an expression of an emotion or an abstract impression of reality. It also should contain stories , maps , warzones , ideas , darkness etc…. The huge scale of my paintings emphasizes the grandeur and infinity of the abstract image. But more important I actually have to work with space when I am standing in front of a huge canvas. 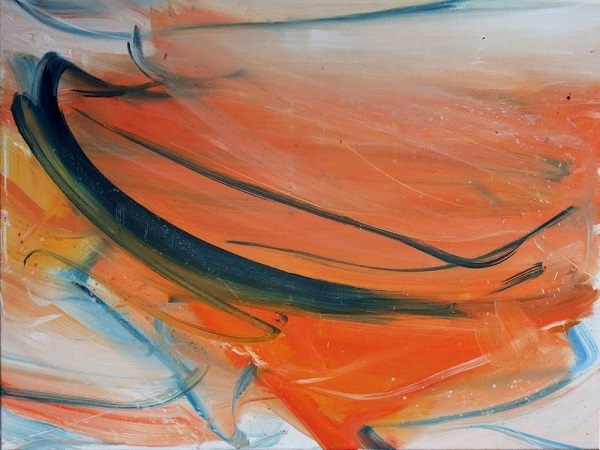 So an abstract painting reflects a totallity of all kind of situations , elements ,intentions etc. Creating such images forms the mean goal of my work.